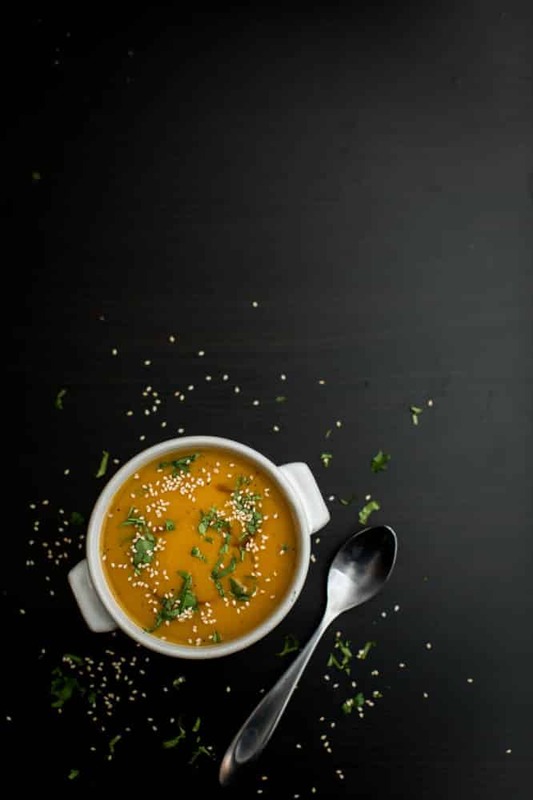 Ginger Butternut Squash Soup | Naturally. Don’t be fooled, it is so far from soup weather in Sacramento. In the past couple of weeks, we’ve had temperatures around 100˚ for a few days and all I want right now is to have the windows open, with a nice cool breeze flowing through (which isn’t looking like it’s going to happen for a bit.) However, when I wasn’t feeling the greatest, I was craving soup. I’ve had a couple butternut squash hanging around since I finished up the photos for the cookbook in June, but hadn’t felt like it was time to cook it yet. I finally reached that point when I really wanted it to start being soup weather. This soup is a go-to of mine and can be easily adapted to the type of meal you like. For the most part, I’ll serve the soup over rice and leave the heavy cream out. In a pot, heat olive oil over medium-low heat. Add onions and cook until soft, 5-6 minutes. Stir in ginger and cook for 30-60 seconds, just until fragrant. Measure in squash, broth, salt, and pepper. Bring to a boil, reduce to a simmer, and let cook for 20 to 25 minutes, until squash is extremely soft. Puree soup using an immersion or regular blender. Return to pot (if using regular blender) and add heavy cream (if using). Divide soup into two bowls (with rice, if using) and top with a swirl of soy sauce and a sprinkle of cilantro and sesame seeds. Yum yum yum! We are definitely approaching soup weather up here, so I’m all about this! Plus: sesame seeds? New favorite on EVERYTHING. Literally. Everything. No matter the weather, soup definitely has the power to comfort and raise your spirits, right? This one has all of my favorite flavors and I’m tucking this one away for a night I need a bowl of comforting soup. Looks rich and delicious! Butternut squash soup is my favorite. This looks delicious. And I feel your pain – it was almost 90 here last weekend. WHY!!!! I’m ready for fall! It has been fall weather here in Montreal though (we have already had to turn on the heat a bit, as it has jumped down to 40 deg. F at night! ick! ), so I was planning a squash soup already when you posted this! My usual squash soup is a butternut squash apple soup, the tartness of the apple balances out the richness of the squash beautifully. Once I also made a butternut squash, pear, and vanilla bean soup which was amazing, but it only happened once because it wasn’t as weeknight friendly. But, I love your idea of pairing it with ginger and garnishing it with sesame seeds, soy sauce, and cilantro! I have some sweet dumpling squashes on hand that I plan to try out with your recipe this week. I made this tonight and it is by far the best squash soup I have had! I made it with sweet dumpling squashes instead, and added in some rice vinegar and sesame oil at the end. As someone who eats soup all summer in Silicon Valley…well, it’s always soup season for me! (Obvs SV has slightly different weather than Sac, but still.) This sounds totally delightful and comforting. I love the addition of ginger to warm up an already warm, comfort food! Delicious! This sounds absolutely delicious. 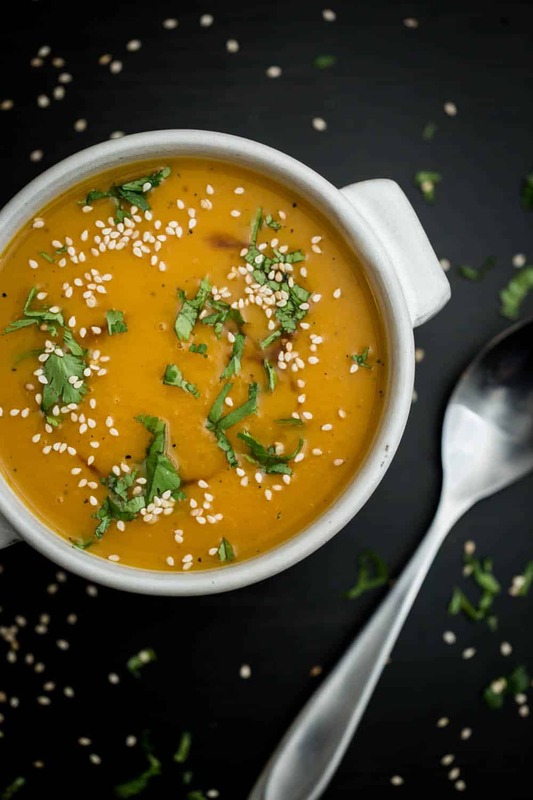 I love a good butternut squash soup, and the ginger seems like a great addition. I like the simplicity of the soup and the flavors of the add-ons for serving. It’s definitely getting close to soup weather where I am. Excited to crack out a big soup pot to make this! I adore butternut squash soup too! Totally worthy of eating during a heatwave. Yum! Love the addition of toasted sesame seeds in this. I can’t wait to try it! Mmmm, this looks perfect. Fall has definitely arrived here in Vancouver, it’s absolutely dumping rain today..so I could deal with a nice bowl of soup 🙂 love those photos, by the way – gorgeous!! Sounds delicious! Adding coconut milk instead of the heavy cream would be Devine also. I’m hungry! I may be making this for breakfast as I have a few butternut squash from the garden haging around and waiting to become something wonderful . 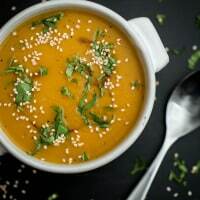 I love butternut squash soup & have a few recipes I use. But I will be making this one soon! I start treatment, again for brain cancer in a couple of weeks, so hope to make it before then! Very delicious- although I would cut down the broth slightly while cooking, and then add a little if needed after pureeing to get the right consistency. I am just tasting this delicious soup!!! It’s excellent!! Instead of brown rice I used bulgur. Thank so much for sharing this recipe!!! Didn’t have enough squash so I added carrots and a sweet potato and it was yummy!